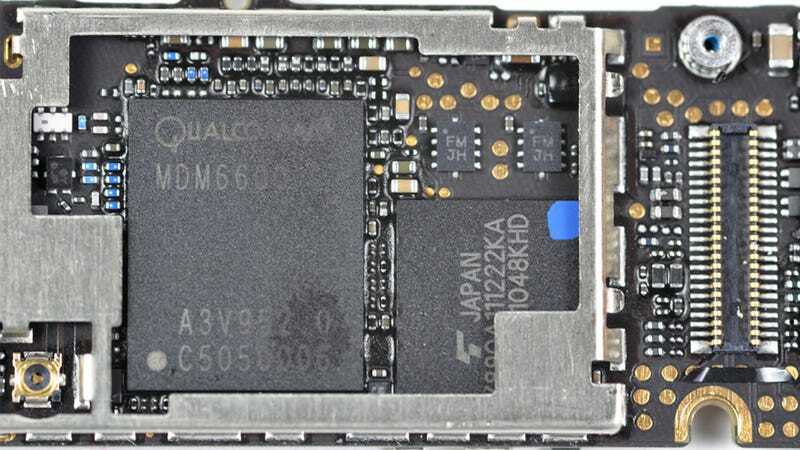 As they're wont to do, iFixit and 9to5Mac have (separately) torn apart the new Verizon iPhone, discovering some small changes and one big one: the Qualcomm MDM6600 chip inside. That chipset supports both GSM and CDMA transmission (HSPA+ data rates up to 14.4 Mbps) and it happens to be the one that you'll find inside a Droid Pro world phone. So why isn't Verizon's a dual mode Super-iPhone? iFixit notes that it might've been "easier to design antennas for a CDMA-only phone—this phone supports two cellular frequency bands, while Apple supports five bands in the GSM version."